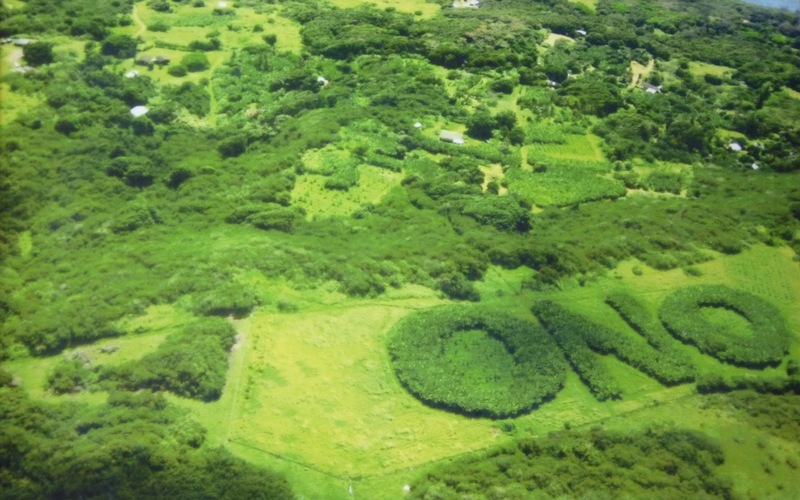 The Ono Organic Fruit Farm was a laid-back place after all. 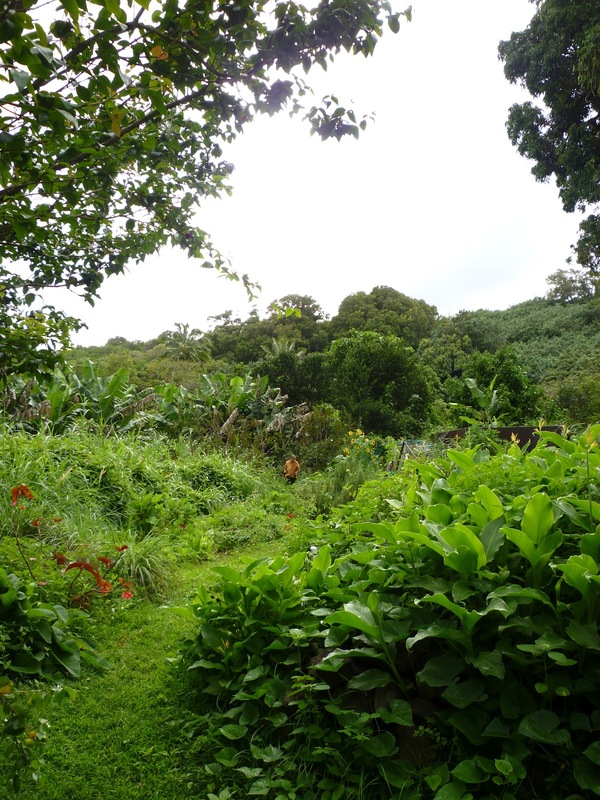 We were a half-hour late for our tour of this farm south of Hana, and it didn’t really matter; others were even later than that. So the staff gave the second part first, to those On Time, and we tardy folk just had to stay around longer if we wanted to walk around to see and learn about the trees and bushes. 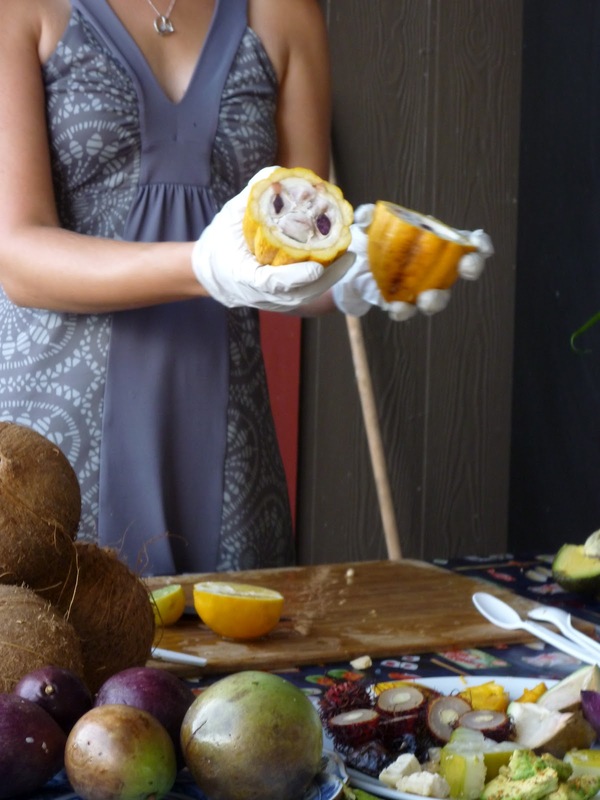 The main event was the fruit-tasting, for which we sat on an open-air porch before a table spread with a collection of tropical fruits. The young married farm interns chose one after another of the fruits and cut them into pieces to pass around to our group of twenty or so, giving us commentary all the while about the business operation, the agricultural practices, and what they knew of the individual species. Being the daughter of a fruit farmer myself, I was full of questions about the cultivation or the fruits, many of which the fairly green farmers weren’t able to answer. That was o.k. There were plenty of other specific things and facts on which I could focus my mind and my camera, and in this case, with those particulars being so strange and new, it’s was terribly stimulating. 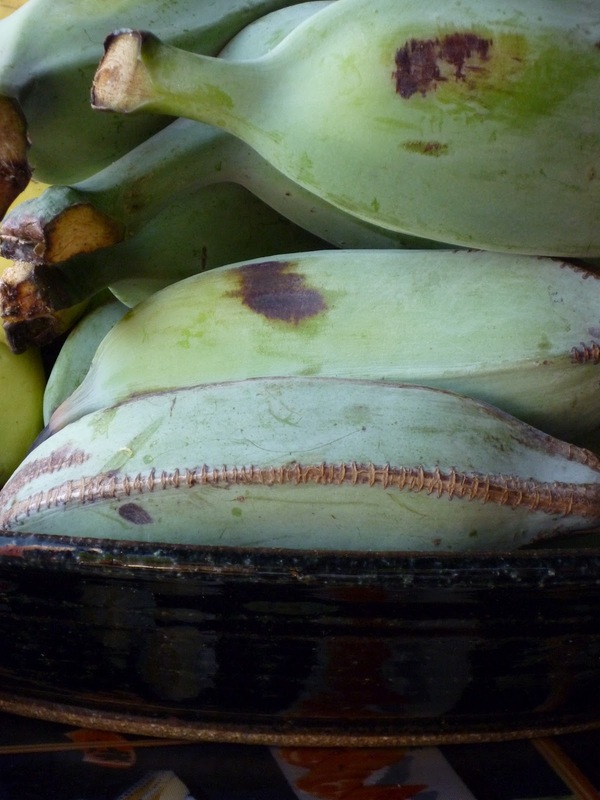 This farm makes most of its income from bananas, including the more commonly found Williams variety, of which the kind we eat here is a type, and also the Red Cuban Bananas and Ice Cream Bananas. But oh, what a lot of other goodies they grow. 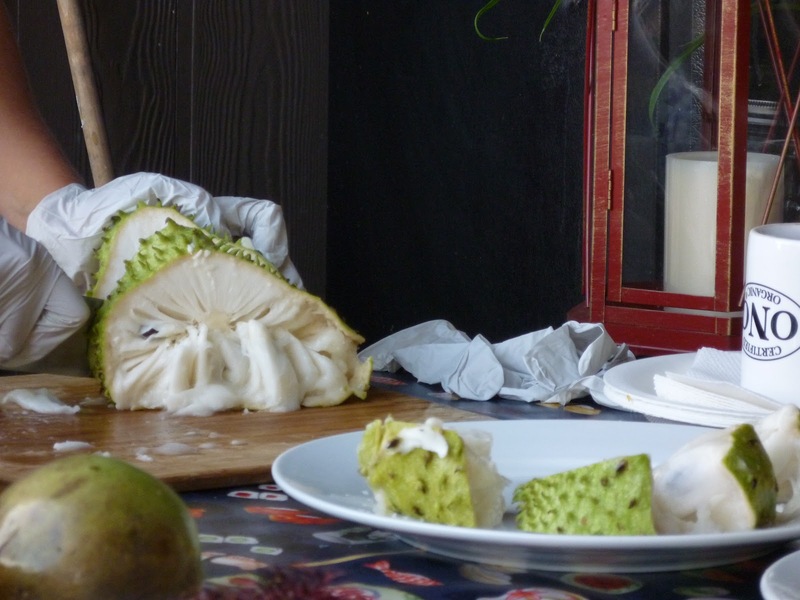 I was intrigued by the soursop, which is a plant related to the chirimoya and the pawpaw. It was tasty but not overly sweet, and had a sherbet-like texture. In fact, it is used in tropical climates to make sherbet or refreshing drinks. We were told not to eat the seeds, so I picked several out of my chunk of fruit, very smooth and black seeds that begged to go home with me, so I put them in a scrap of paper towel in my purse. Later on I’m pretty sure I transferred them to my suitcase, but by the time I unpacked back home in my bedroom, they were nowhere to be found. I’ve been sad ever since, but Mr. Glad is actually glad that I’m not planting a tree for nothing. It wouldn’t be for nothing to me, but it certainly would be without fruit. 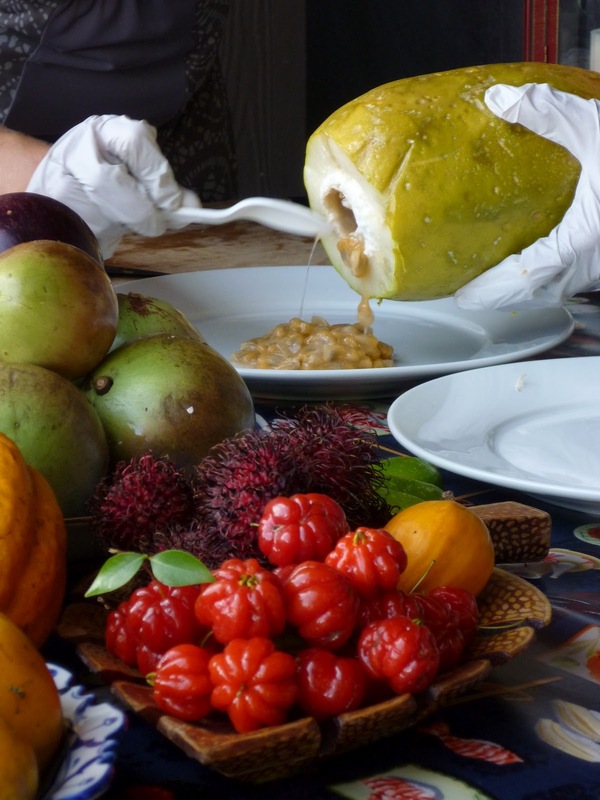 We ate some of the passionfruit shown above, and later bought jars of lilikoi jam that had been put up just that morning from a variety of passionfruit grown there on the farm. The red fruits in the foreground are Surinam “cherries,” a pretty sour, but juicy, experience, not anything like a true cherry. Those mangoes they grow on Maui might have been our favorite fruit of the trip — they seemed exquisite compared to the Mexican ones we are used to here. I always love coconut, and the pineapples we ate on the farm and elsewhere on the island were the Maui Gold hybrid, low-acid and amazingly sweet. One time years ago I had read a long article about durian fruit, and always took it as a given that no one would ever even gently suggest that I eat some — but there it was right in front of me, an opportunity to overcome my stodginess and pretend to be a daredevil. Trying strange foods is not my idea of fun, and durian may be the strangest of all. You may know about durian, that in several countries of the world it is illegal to carry it on public transportation, because of its aroma — or stink, as it seems to those who get physically ill over it. Other people get downright addicted to the fruit, and travel the globe following the durian harvest. I ate it and survived. In case my readers have the chance to taste durian sometime, I won’t say too much about it, except that it did not seem like a fruit. It was not juicy; it was soft; it had sulfuric components….The interns said that the piece we sampled was fairly mild tasting. It didn’t make me sick, but neither do I have any interest in eating another bite. I thought the fresh cacao seeds would be bitter, like the roasted beans, but it was more pleasant than that, a vaguely chocolatey and unsweet, soft crunch. Maybe because our tasting had begun late, the walking tour afterward seemed to pass way too quickly. 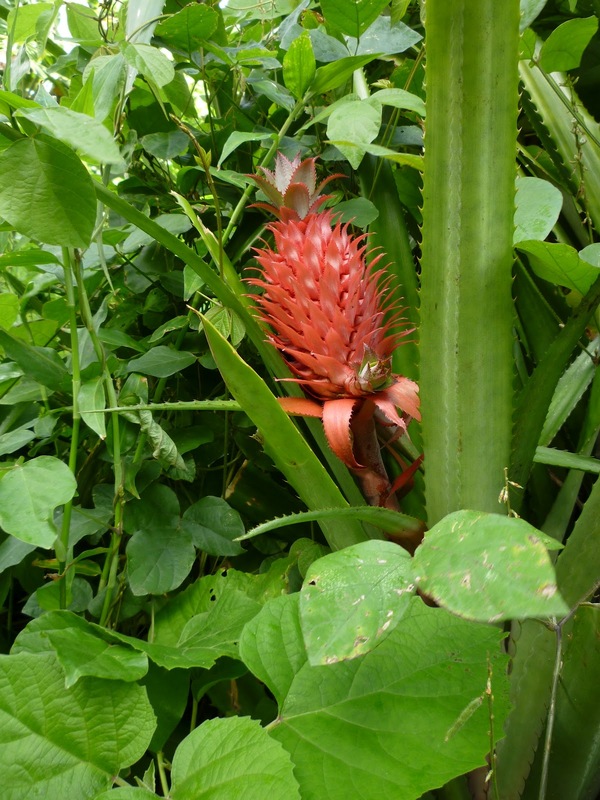 I was constantly lagging as I tried to get pictures of macadamia or cashew or breadfruit trees. One common tactic of organic farmers is to interplant different crops, so that pests and diseases don’t spread too easily. 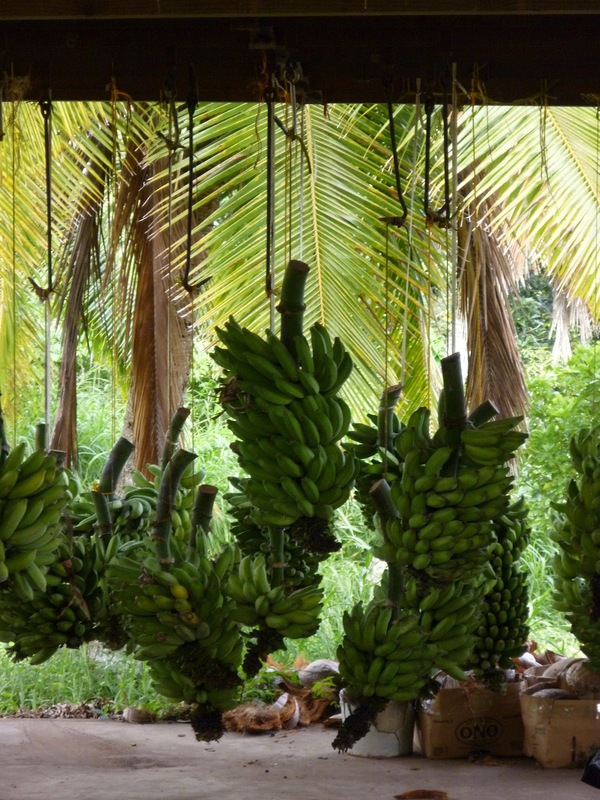 Here at Ono Farms coffee bushes often grow in the shade of banana trees. Our visit was all close to the ground, but on the wall above the heads of our hosts was this aerial photograph, showing how bananas were planted years ago to spell out the name of this place where our senses were flooded with tropical flavors. 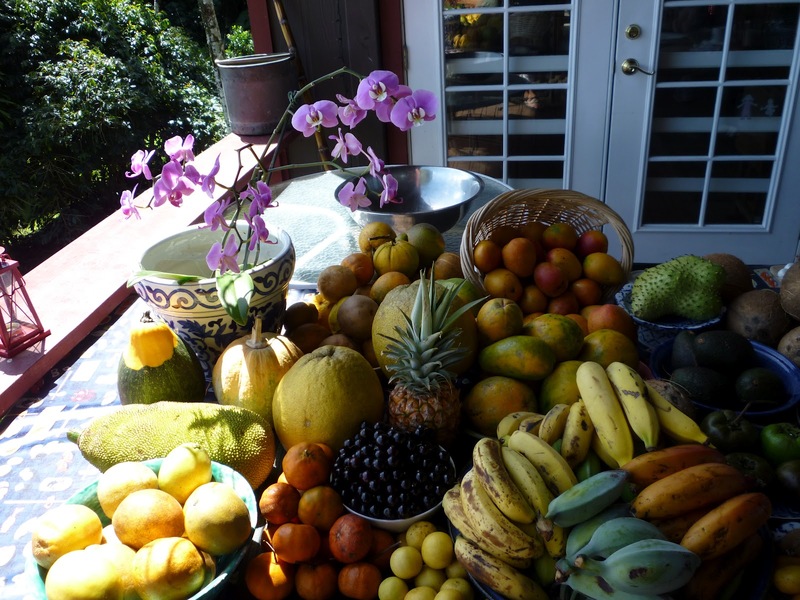 The growers were right when they named their farm: in Hawaiian Ono means delicious.